In keeping with the special atmosphere that is generated by the The Oulton Park Gold Cup meeting, FISCAR took the opportunity to acknowledge its special status by introducing a titled race that its members could compete for. Whilst FISCAR retained the old fashioned sense of camaraderie generated by the Historic Inter Marque Team Challenge, it has also now introduced a class structure and, for this meeting, The Blaster Bates Trophy for the outright winner. Derek Macintosh Bates was born in Crewe in 1923. He served with the RAF during the war flying Halifax bombers and also became a specialist in bomb disposal. After the war he returned to his previous employers, Rolls Royce, only to find that the company, making substantial cutbacks on high wartime production levels in post war austerity Britain, was unable to offer him a suitable position. He decided to set up his own demolition business utilising the skills with explosives that he had acquired during the latter stages of the war. This expertise was greatly in demand particularly in respect of the demolition of the many high stack chimneys that peppered the landscape of the industrial North of England. It was in this capacity that he earned the nickname ‘Blaster’ Bates. One of his many contracts was in blasting out the land for the construction of Oulton Park race track. His impact here was twofold, since not only was it a literal one, but it also led to his naming of what is probably the best known corner on the circuit when during the course of setting charges he startled a courting couple. Thus was born Knickerbrook! Blaster Bates was one of those larger than life characters and it was backed up by his 6’ 4” stature. Incredibly active, he had many hobbies including motor cycling, shooting, fishing and rugby. He was a gifted raconteur, in demand as an after dinner speaker and on television chat shows and made a number of records in which he recounted his most hilarious explosive exploits. He also undertook a lot of charity fund raising. He died in 2006 from congestive heart failure, following a long battle with diabetes. Today, we remember his involvement in the construction of the magnificent Oulton Park circuit and his naming of its most famous corner. It is usual when naming a trophy after an individual, as a matter of courtesy, to seek the approval of the family but at the time of writing, FISCAR had so far failed to make successful contact. We sincerely hope however that members of Derek ‘Blaster’ Bates family would approve of this manner of remembering him, and with cars from the decade in which the circuit was constructed. The entry for this race, whilst of high quality, was frankly disappointing numerically, with just 14 cars, later reduced to 13 when Steve Wright had to withdraw his Porsche 356, following a back injury. Mike Freeman put his Lotus Elite on pole by 1.5 seconds from Jonathan Abecassis in his Austin Healey 100/4 so it appeared, on the face of it, that the Trophy was only going to go one way! The Frogeye Sprite of Allan and Neal Cameron benefitting from the rather damp and slippery track conditions qualified an excellent 3rd, albeit over 4 seconds behind Jonathan, and alongside, qualifying a fine 4th was Tim Stamper, in Richard Bell's Aston Martin DB2/4, despite a badly behaved hub spinner which allowed the nearside front wheel to part company with the car, fortunately without any apparent damage. Geoff Ottley qualified his XK120, 5th, with the Alfa Romeo Guiletta SVZ of Brian Arculus alongside on row 3. 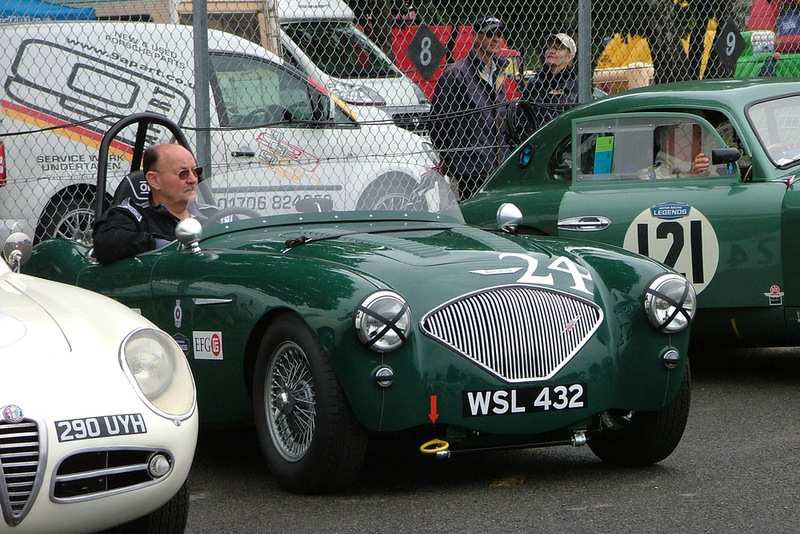 Jim Campbell, looking unusually 'cool' in shades, qualified his Austin Healey 100/4 in 7th. It was great to see Glynn Allen out with us in his 2.6 litre Aston Martin DB2 lightweight (are there any others left with the original 2580cc engine?) and, sharing with Darren Roberts, the car qualified 8th. Austin Healey Captain, Nigel Grice, qualified 9th in his 100M. It's always a joy to see Keith Hampson's Sunbeam Alpine Le Mans out with us and Keith qualified 10th alongside Nigel, whilst the 6th row provided a sharp contrast of the 'Little and Large' variety with the Frogeye Sprite of John Tewson dwarfed by the massive presence of the thundering Allard K3 of in Mark Butterworth. Last but not least, and surely destined to go forward during the race was John Waterson in his Lotus Elite, creating an Elite Top and Tail symmetry to the grid. Tim Stamper about to enter the DB2/4. It did not end well as Tim's fraught affair with Oulton Park continued when he ran out of fuel on the outlap. Sadly we were to lose another car before the start as Tim Stamper ran out of fuel on the way to the startline leaving a gap in row 2, now occupied solely by the diminutive Cameron Frogeye. The little car's excellent qualifying position left it vulnerable on a drying track and it was overhauled on the startline by Geoff Ottley in the XK120 and Brian Arculus inhis Alfa, both making good starts. Any expectation that Mike Freeman would walk away with the race was firmly quashed when Jonathan Abecassis took the lead on the first lap and held the Lotus Elite at bay for several laps. Even when Mike found a way by, Jonathan immediately retook the lead. The show they put on for the lead was hugely entertaining, whilst Geoff Ottley appeared initially to be well established in 3rd place and drawing away from Brian Arculus in the screaming Alfa. Meanwhile, Nigel Grice was making a mockery of his 9th place qualifying position and charged up the running order to displace Geoff for 3rd on lap 4. Brian Arculus, was, as always the first to pit, bringing the Alfa in as soon as the pit window opened at the end of lap 3. He was followed in, at some distance, by John Waterson, in his Lotus Elite and John Tewson in the second of the Frogeye Sprites. Having been passed by Nigel Grice, Geoff Ottley brought the XK into the pits for his mandatory stop at the end of lap 4 and Nigel brought the Austin Healey in at the end of the following lap. With such a big pit window on offer, the true order of the race on the road does not fully emerge until late in the race. However, at the front, well clear of the rest, Jonathan Abecassis and Mike Freeman continued to race at close quarters and this continued through to lap 8 when Mike got a run on Jonathan out of Lodge Corner going into Deers Leap. It was perhaps the moment that decided the destiny of the Blaster Bates Trophy for it was on that lap that Jonathan had decided to pit but with the Lotus on the inside, he couldn't simply swing across to enter the pit lane so had to back off to come across the track behind Mike and this loss of momentum naturally translated into lost time not readily apparent until Mike himself pitted two laps later and emerged in front with an almost 5 second lead. Further down the field, John Waterson had, not unexpectedly, improved on his qualifying position in the Elite, whilst Keith Hampson was circulating well, having firmly established the Sunbeam Alpine ahead of Mark Butterworth's Allard and John Tewson's Frogeye Sprite. Jim Campbell stayed out of the pits until lap 9, and due to earlier pitstops was actually 3rd at the time but he emerged in 7th, the position he retained to the end. Despite the closeness of their qualifying times, Jim had never been quite able to get on terms with Brian Arculus, who brought the Alfa Romeo home in 6th place some 13 seconds ahead. The last pit stopper was leader Mike Freeman, who brought the Elite in on lap 10 and his emergence, 4.6 seconds ahead of Jonathan Abecassis in the 100/4 returned the race positions and gaps to true order. Whilst Jonathan chipped away at Mike's lead, it was still 4.2 seconds at the flag, but theirs had truly been a memorable tussle and Jonathan, by a small margin had actually put in fastest lap. Nigel Grice brought the 100M home in 3rd place, just under 3 seconds clear of Geoff Ottley in the XK120, a fine effort by Geoff who obviously lapped with great consistency since his best lap was over 1 second slower than Nigel's although Nigel of course had started from further down the grid. Glynn Allen and Darren Roberts brought the lovely original DB2 lightweight into 5th. Full race, team and class awards will follow, but another FISCAR race had fallen to a Lotus Elite, although a different one on this occasion, that of Mike Freeman, and now the first winner of the Blaster Bates Trophy.